"You are the key to the wind's power. If that power is resurrected, this world will again be controlled by gods and cultures will be denied. For that reason His Excellency told me to stop at no means in capturing Red Eye and returning him to Zoro Earth." Ruda, distinguished by his one red eye, is heir to his family's heritage as the priestly users of the wind. On the eve of his inauguration as the new Wind Master, Ruda's home in the once peaceful land of Zaar is under siege by the relentless Zaroan forces. Fire rains from the skies as the mecha army destroys the village and the warriors descend in their slaughter of its inhabitants. From the temple in the hills beyond, Ruda sees the conflagration, and desperately makes his way to find out the fate of his father, who is slain by the blue-eyed Agahari before she completes her mission by capturing Red Eye. Ruda's sister Ansa, the vessel of the power of the Wind, comes to his rescue. She is no match for Agahari, however, who discards Ansa's bested body, but not without noting the girl bore the same birthmark she herself does. Agahari returns with her charge to Lord Zanak, her father, for whom she has embarked on this assignment. Zanak seeks to harness the power of the wind—the one force that can disrupt the flow of culture that has been developing over the past many years, and can bring the world back to its roots in mysticism. With the keeper of the knowledge in his possession, Zanak can unleash his own plans for the future with no opposition. There are, however, hidden elements that can empower Ruda to rise to this challenge, and his allies may be found in unexpected company. Will Zanak unlock the secrets he is after, or can Ruda overcome his inexperience and fulfill his role as master of the wind? Manga has combined the two parts of this OVA series based on a Sega game into one contiguous show. The character designs are based on those of Masamune Shirow, the talent behind the Ghost in the Shell manga. 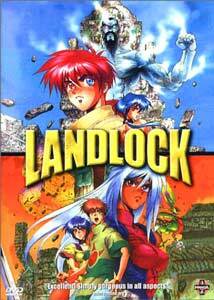 Landlock's combination of action and mysticism makes it a welcome change from more traditional storylines, but the show does suffer due to its short runtime, which doesn't allow for in depth character development to help hold one's interest. In the first half, the plot is structured with a fairly disjointed narrative which, while on one hand lends an air of mystery, also creates confusion. Action in the first part is pretty good, and violence is not underplayed. The characters are familiar territory, and as the plot unfolds, the show has potential. In part two, the fragments that should have been extrapolated on don't get the coverage they warranted. Instead, the show bogs down with unimportant banter while only briefly touching on areas that would have fleshed out the story, such as the significance behind the power of the wind. Many coincidental elements are dropped in that also have a very familiar feel to them. There are some decent twists to be had, and overall this was worth a watch, but there are other titles that will be more rewarding in the long run. Image Transfer Review: Video quality is for the most part quite good, with reasonably saturated color, and solid blacks. Backgrounds display a wide range of hues. There is a moderate amount of aliasing and rainbowing on tight linework. Compression issues are minimal. Audio Transfer Review: Stereo audio is well done, with good use of the stereo field. Dialogue is easy to discern, and musical cues have some decent directionality. The dub deviates from the Japanese script quite a bit, but is performed reasonably well. Extras Review: Extras include character bios, an art gallery, and the Landlock trailer, found under the Manga logo on the extras menu. I would note that there are a number of inconsistencies in the character names; the cover, subtitles and bios all have different spellings. The main character, Luda, is refered to as Lue'der (which I believe is the correct version) on the cover, while his father is Moog in the subtitles, and Mohg in the bios. Like their other discs, Manga's stock promotional extras cover their titles and associated merchandise. The Manga trailer features a compilation of clips from Ghost in the Shell, Ninja Scroll, Perfect Blue, Patlabor, Street Fighter and X and more. A DVD catalogue, and a Manga merchandise section are provided. Easter eggs for the Manga logo, Sputnik 7 and Palm Pictures icons feature a trailer for Blood, The Last Vampire, Sputnik promo, and a promo for The Mad Capsule Markets OSC-Dis DVD and VHS respectively. Weblinks are also included to the company websites via an HTML page accessible by DVD ROM, or by entering the onscreen addresses into your browser. Landlock was enjoyable, with some interesting twists and a concept with potential, but in the end it doesn't quite deliver all it promises to be a truly satisfying work. The animation is good, the characters familiar, and the mysticism different. This may appeal more to those who have the game, but as a standalone would only be worthy of a rental.